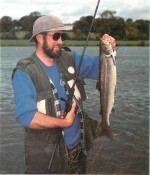 In the days when salmon were abundant, flies were gorgeous extravagancies which bore little relation to natural insects. Today’s more functional fly retains this richness of colour. 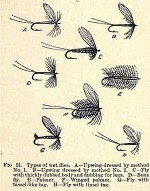 Evolving from the early trout flies, the contemporary salmon fly shows little evidence to associate it with the imitation of natural insects. It is generally considered that early salmon flies were tied in ignorance of what the salmon actually thought they were, and only recently has it beeiv realized that salmon do not feed while travelling to their spawn-ing grounds in freshwater. Colour has always been considered important of course, but as the ideas of one fly dresser are not necessarily those of his contemporaries, almost every known combination became available. 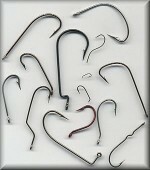 In spite of this variety of colour, a great similarity among the patterns as to shape, style and character emerged. 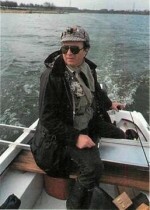 Type, size and presentation were considered less important than they are today: the reason being, perhaps, the greater abundance of salmon in the earlier part of this century. 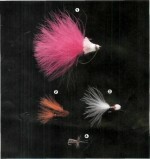 The gaudy fly is still produced, though more as a fly tying exercise than anything else. The more durable and easily produced hair-winged fly is brightly coloured, and provides a better imitation of a natural insect. Indeed, the gaudy fly will always win over a drab one. 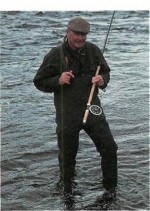 Such names as ‘Jock Scott’, ‘Black Doctor’, ‘Blue Doctor’, ‘Blue Charm’, ‘Chalmers’, ‘Dunkeld’, ‘Thunder and Lightning’, ‘Durham Ranger’ and ‘Dusty Miller’, ‘Green Highlander’ and ‘Green King’, the ‘Logie’, and many others, have become well known to salmon fishermen over the years. 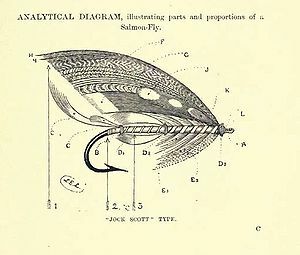 An object as colourful as the traditional salmon fly lends itself as an art form, and probably for this reason alone its survival is assured, even though it has lost much of its practical popularity on the game fishing scene. Modern flies with hair wings still retain the original brightness of the traditional ones, particularly regarding bodies, tails and hackles. In most instances these are retained in their entirety, only the wings being different. The hairs used for these wings are usually dyed the same bright shades of red, blue, yellow, green and orange, but in some instances they are left in their natural state. The ‘Blue Charm’ is a good illustration of this, as the teal and mallard flank feathers of the original patterns are replaced by either brown bucktail fibres or brown squirrel tail fibres, according to the size of hook. To distinguish between the two dressings, the hair-winged version of the ‘Blue Charm’ was called ‘Hairy Mary’.